When mobility predictions are not correct, military ground vehicles become immobilized, putting Soldiers at risk and jeopardizing mission success. With a goal of improving mobility predictions, NATO representatives from around the world met at Michigan Tech’s Keweenaw Research Center (KRC) for a technology demo to showcase the differences between legacy and current generation mobility prediction software. 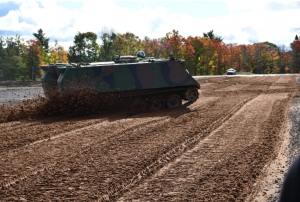 The U.S. Army Tank Automotive Research, Development and Engineering Center (TARDEC) hosted the 3-day cooperative demo, called “Next-Generation NATO Reference Mobility Model (NG-NRMM) Development,” and sponsored by the NATO Science and Technology Organization. Leveraging the most advanced physical models and modern computing power, mobility models will improve military capability to predict the mobility of ground platforms over a wide range of terrains. Event keynote speaker TARDEC Director Dr. Paul Rogers said the current NATO tool for predicting mobility is outdated and needs to be modified to improve future mobility success. “That’s what we owe our warfighter, and that’s what we owe our future generations of engineers and scientists,” he said. A new model will replace a decades’-old model built off empirical data from the testing of large vehicles on different soils. Advances in computing will allow them to better model the physics of vehicles and their interactions with the soil. “What this allows us to do now is collect a whole new data set and then use that data set to optimize our analytical tools, our computer-based models, physics-based models so that we can do predictive analysis on soils that we have not tested,” Rogers said. The KRC was the chosen proving ground because it has long tested military vehicles and been involved in developing the NG-NRMM. The KRC has added 500 acres onto its now 900-acre site to allow expanded testing, said Jay Meldrum, the Center’s director. He said the courses test vehicle interaction with everything from soft soil to telephone poles and parking curbs to rocks and boulders. One run has a 30 percent side slope. Meldrum refers to the set of test courses as the “golden proving ground” for the mobility of military vehicles. “We’ve digitized every pebble in the proving ground here into a database and they can have that database. So, they can drive that vehicle through the terrain in the computer and try to predict the mobility, as we call it, of that vehicle going through that rough terrain,” said Meldrum. The database was created using a generic military vehicle equipped with many sensors. Prior to this database, each vehicle had to be physically tested with individual terrains.